Surface remeshing, volume meshing and generation of boundary layers of prismatic elements with varying thickness for Computational Fluid Dynamics. PypeS is the glue among vmtk scripts. It allows new scripts to be written easily, to have a common interface and to interact with each other. Need support for vmtk? Please use the vmtk official support group. Need to develop problem-specific algorithms, custom pipelines or dedicated user interfaces? 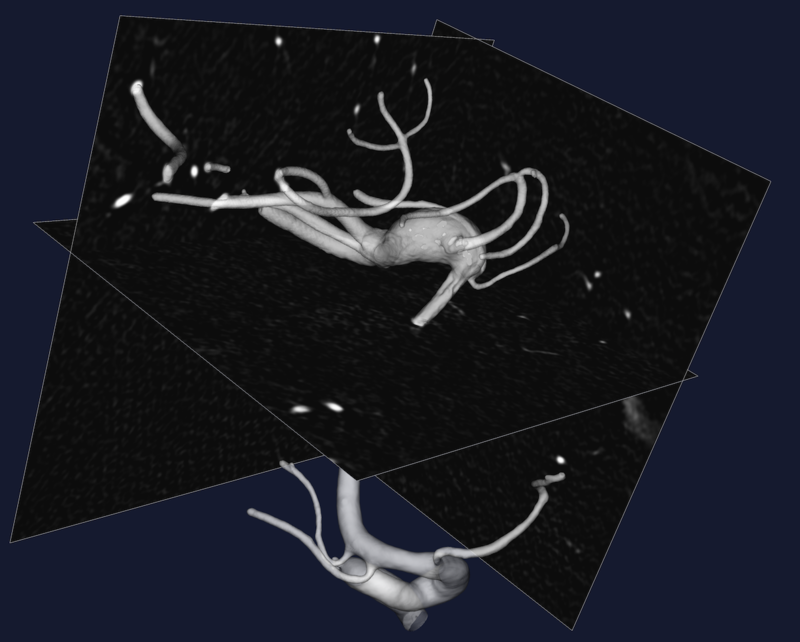 Take a look into the Level Set Segmentation tutorial to learn how to reconstruct the 3D surface of a vascular segment from CT or MR images using level sets. A new gradient computation modality based on upwind finite differences allows the segmentation of small (down to 1.2 pixels/diameter) vessels. Interactive level sets initialization based on the Fast Marching Method. 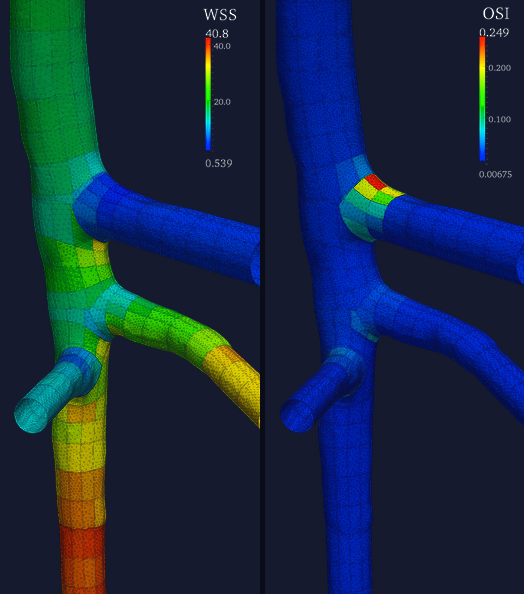 This includes a brand new method for selecting a vascular segment comprised between two points automatically ignoring side branches, no parameters involved. 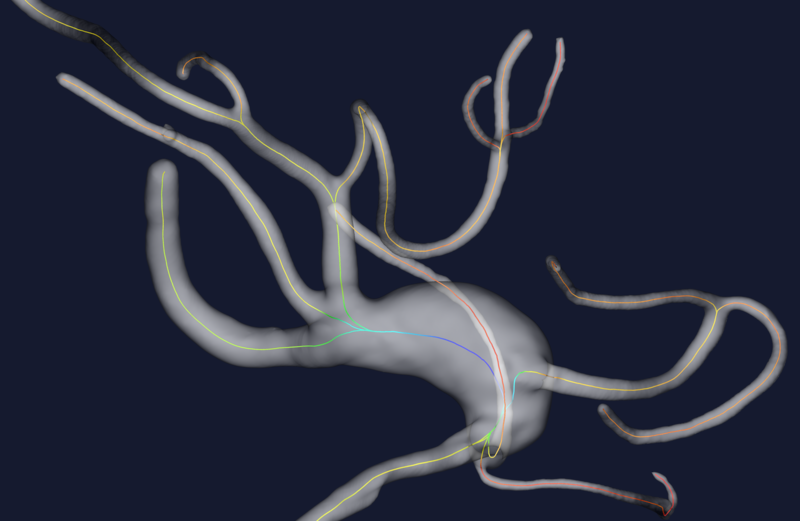 Segmenting a complex vascular tract comes down to selecting the endpoints of a branch, letting level sets by attracted to gradient peaks with the sole advection term turned on, repeating the operation for all the branches and merging everything in a single model. Take a look into the Computing Centerlines tutorial to learn how to compute centerlines of a vascular segment. Centerlines are powerful descriptors of the shape of vessels and are determined as weighted shortest paths traced between two extremal points. In order to ensure that the final lines are in fact central, the paths cannot lie anywhere in space, but are bound to run on the Voronoi diagram of the vessel model, considered as the place where the centers of maximal inscribed spheres are defined. Centerlines are determined as the paths defined on Voronoi diagram sheets that minimize the integral of the radius of maximal inscribed spheres along the path, which is equivalent to finding the shortest paths in the radius metric. Take a look into the Geometric analysis tutorial to learn how to analyze the 3D geometry of a vascular segment and into the Preparing a Surface for Meshing tutorial to learn how to prepare a surface for mesh generation. Quantifying geometric features of the vascular segment, those associated to bifurcations, such as bifurcation planes and bifurcation angles, and those associated to branches, such as curvature and torsion. Curvature and torsion are tightly linked to the definition of the Frenet line frame, constituted by a tangent, a normal and the binormal. Increase surface smoothness prior to building the mesh. Image segmentation can result in bumpy surfaces, especially if the image quality is not high and one didn’t use any curvature term in level sets evolution. Flow extensions are cylindrical extensions added to the inlets and outlets of a model. They are important for ensuring that the flow entering and leaving the computational domain is fully developed, so that fully developed boundary conditions aren’t forcing the solution in the actual vessel. Surface remeshing is performed under the assumption that the surface requires improvement before being used for CFD. After the surface has been remeshed the volume is filled with a combination of tetrahedral and prismatic elements. We can heighten the density of the mesh near the wall by generating the boundary layer. A common application is mapping and patching of fluid dynamics variables, such as wall shear stress (WSS) or oscillatory shear index (OSI), obtained on the surface mesh typically by means of a CFD simulation. By construction of a harmonic function over each vascular segment, vmtkbranchmapping maps and stretches the longitudinal metric to correctly account for the presence of insertion regions at bifurcations; the additional StretchedMapping array is added to the surface. Writing classes implementing algorithms and writing actual tools to be used for everyday work are two distinct tasks. Very often a well-designed object-oriented library ends up to be used in ever-growing collections of shell, Python or Tcl scripts or small C programs, each with its own argument parsing and I/O sections. Very often high-level code is duplicated to provide slightly different functionality. On the other side, writing a GUI is a time-consuming task, and adding new functionality requires time, which might deter experimentation. PypeS goes in the direction of providing a flexible framework for high-level code, both from the user’s and from the developer’s points of view. The user wants to get things done minimizing the work required and the amount of intermediate data generated. The coder wants to limit the amount of code, she/he has to cut and paste (and maintain), and to quickly add new functionality and make it interact with what she/he’s ever written before. We are pleased to announce the latest version of VMTK is ready for general use! Please see the documentation below for details. VMTK has officially embraced the Anaconda Python packaging and distribution system for dependency and code management. Official releases are posted to the VMTK Anaconda Channel. Our Installation Instruction have been updated on the VMTK webpage to reflect the change. Executable installers are also available at the VMTK Downloads Page. In the future, we plan to also post releases to the conda-forge Anaconda channel. We are waiting for conda-forge to support VTK on MacOSX before making this transition. It is now significantly easier to break up pypes run on the command line. Instead of relying on output members to specify input array names for scripts down the pype, we now include sensible defaults to the input array names. It is now possible to run one set of commands which generate a surface/centerline from an image, write those files to disk, and run another set of commands which perform further calculations or visualizations with no need to respecify array names. It should be noted that this does not require any change in workflows that are already predefined. Any manually specified pype argument will override the default value. The same goes for vmtkscripts which are run from within a conventional python file. The default values have been updated on the VMTK Docs Webpage. VTK 8.1 is the default which will be distributed with binary packages. Custom builds should be able to use back to VTK 6. Unit Testing and Continuous Integration - We’ve built a PyTest based unit-test framework from scratch, and are using Travis-CI and Appveyor to test pull requests. Modernization of Our CMake Build System to improve local development builds. Activation of a development build no longer modifies LD_LIBRARY_PATH on Linux, or DYLD_LIBRARY_PATH on MacOSX. We have transitioned from CMAKE_MINIMUM_REQURED(2.8) to Version 3.4. External projects depending on VMTK should note that we now export VMTK-Targets in our cmake install methods. Overhaul our packaging & distribution system to allow for regular symantic version releases. #249 Add additional smoothing filter to vmtkimagesmoothing using ITK an-isotropic diffusion. #247 Font size scales based on display screen size. #233 Fix vmtkbranchclipper with insideout enabled. With this release, the following python packages are requirements of VMTK. Please note that this is included soley for informational purposes (and developers who intend to build from source). The VMTK anaconda package (and windows installer) will automatically solve and configure the dependencies appropriatly for your system and current environment. Python 2.7 is no longer supported on Windows. No further packages will be released on the VMTK PyPi channel. Thank you to the following people for dedicating their time and effort into making VMTK 1.4 possible! vmtk 1.4 for OSX has been released!